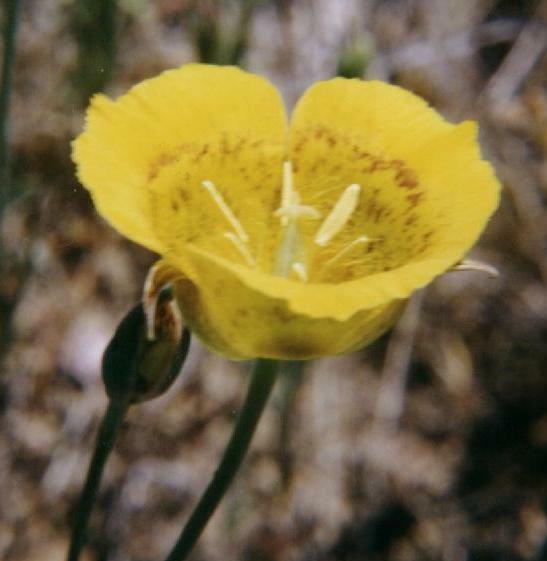 The Mariposa Lily prefers open grassy slopes and adobe clay or rocky soils. This specimen was found on a steep rocky adobe slope. The Calochortas genus was an important food for Native Californians. They roasted the bulbs in the coals of a fire, or steamed them. The seeds were parched for a pinole meal. As with the Wild Hyacinth, proper conservation measures should be used if you want to eat this plant. Harvest only after the seeds have ripened, and plant some seeds where the bulb was taken, and replant any small bulbs found. Back to the Lakeview Bird Farm.